Be the first to share your favorite memory, photo or story of Winona. This memorial page is dedicated for family, friends and future generations to celebrate the life of their loved one. Winona Lyons (nee Corkum), 93, of Iowa City, died January 15, 2019. A long-time Iowa City resident, Winona (“Nony”) was born In Bridgewater, Nova Scotia. She graduated from the Victoria General School of Nursing, Halifax, Nova Scotia in 1948. She worked as a nurse in a variety of settings until age 72, taking a few years off to raise 5 children. She is remembered fondly as a mentor, teacher and friend by her colleagues in Neurology at the University of Iowa Hospital. She took challenges in stride, from rearing 5 children in the rugged Canadian Arctic, to recovering from brain tumor surgery in her 80’s. 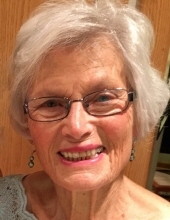 A lover of music, she especially enjoyed playing piano, was a member of the University Club Piano Group and the Iowa City Music Study Group and she delighted in attending musical concerts at the University of Iowa. She enjoyed reading and served as a docent at the University of Iowa Art Museum. She cherished long walks with her yellow lab Molly, and was an avid gardener well into her 90’s. In retirement, Winona and her twin Peggy travelled the world on numerous cruises and tours. She enjoyed family reunions in Nova Scotia with her family, who fondly recall the musicales, lobster dinners, and Cape Breton hikes. Staying active and independent well into her 90’s, Nony relished life, and leaves an example for the rest of us for a life fully lived. She is survived by five children: Robert Lyons (Mariette) of Hinton, Alberta, Margaret Watkins (Danny) of Nantahala Lake, North Carolina, Michael Lyons (Keely) of Portland, Oregon, Peter Lyons (Dalila) of La Canada, California, Nowya Rickels (Jerry) of Anamosa, Iowa; sister Inez Cathers of Winnipeg, Manitoba; 9 grandchildren, 6 great grandchildren, and numerous friends. She is predeceased by her parents, her twin Peggy, sister Doris Clarke and ex-husband Dr. James Lyons. A Celebration of Life is planned for later in 2019. In lieu of flowers, donations can be made to Iowa City Hospice or Mercy Hospital Hospice. To send flowers or a remembrance gift to the family of Winona M. Lyons, please visit our Tribute Store. "Email Address" would like to share the life celebration of Winona M. Lyons. Click on the "link" to go to share a favorite memory or leave a condolence message for the family.